Remove black tyre marks without damaging the floor – quick, easy and safe! 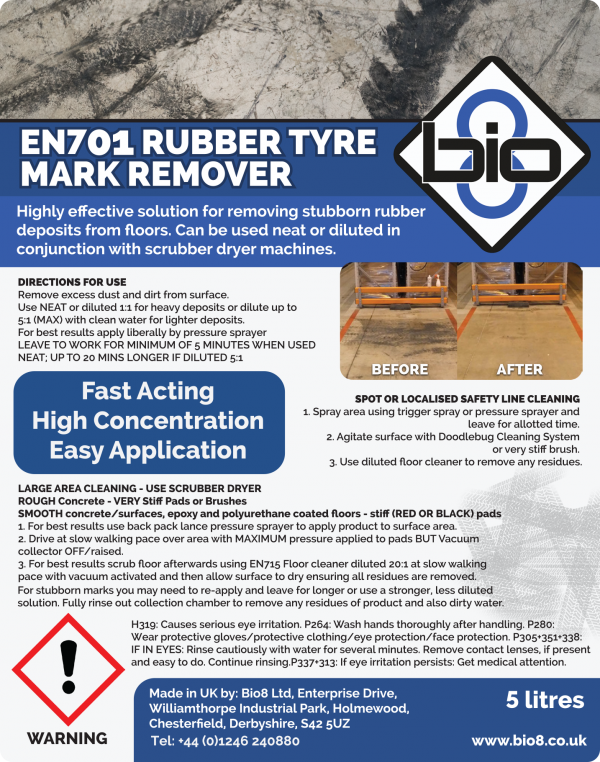 EN701 Rubber Tyre Mark Remover offers high quality cleaning without using dangerous solvents. The compound is designed to be sprayed directly onto black marks left by tyres. Within a few minutes the rubber will start to liquefy and bond with the cleaning agent, allowing it to be wiped away. EN701 has been used at some of the UKs biggest distribution centres. It has successfully removed years of ground in rubber from forklift truck tyres where other products struggled to have an effect. At times tackling rubber often several centimetres thick. EN701 is suitable for all surfaces including concrete, Epoxy coatings, altro flooring, tarmac, tiles, wooden floors and uPVC screeds. This has seen it find a home in a range of diverse locations, including car parks, race tracks, squash courts, changing rooms and factories. While the compound is formulated to be effective on rubber, it’s also non-corrosive so will not affect the surface. EN701 is a concentrated formulation so it can be diluted as needed. Once diluted the formula can be sprayed directly on to the area. After a few minutes the area can be simply scrubbed, then mopped clean. 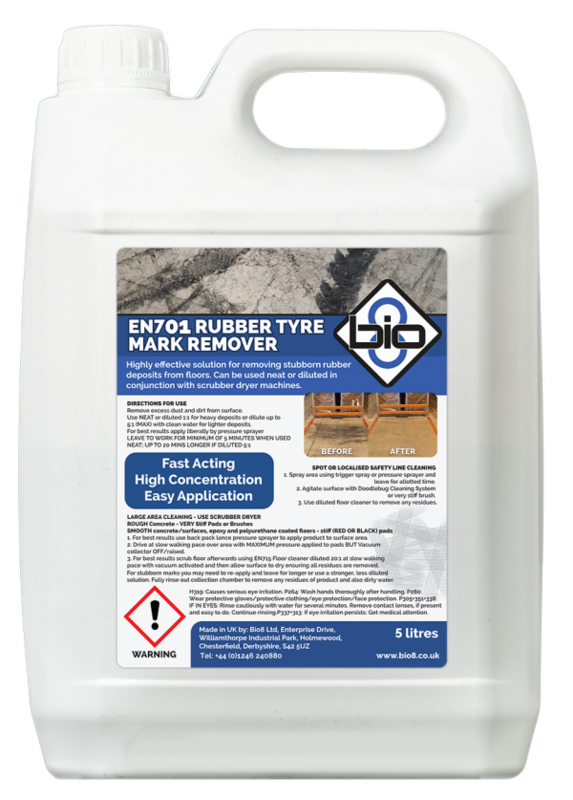 Many customers favour EN701 as it combines quick results with very low health & safety and environmental risks. EN701 will start breaking down rubber deposits up to 4 times quicker than its nearest rival. Also, its great penetrating power breaks down rubber build up with less scrubbing. These factors lead to a substantial reduction in cleaning time. Diluted prior to use. Each bottle lasts longer, also storage cost are reduced. 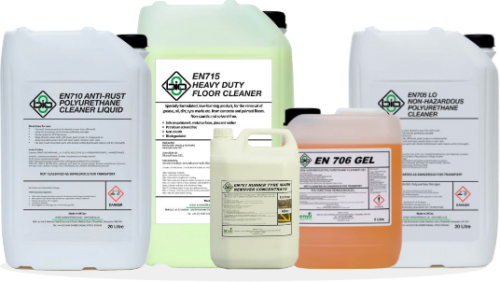 The EN701 formulation carries a very low level of hazard compared to traditional floor cleaners. It contains no solvents, chlorinated or brominated hydrocarbons. This means it is non-flammable and offers no major risk in storage or use. 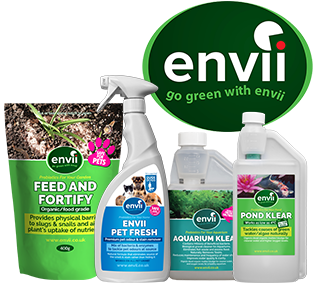 Despite its effective cleaning, EN701 is formulated to not pose any environmental hazards. This means that that it does not require any special disposal arrangements. EN701 can be applied with a trigger spray or a pressure spray. It can then be cleaned with either a mop or a floor scrubber. It is quick and easy to use. Will this work on Tarmac? Can this be used on paving slanbs and concrfete driveways?